Happy birthday to my little baby (not so much anymore) niece Emma. She turns 5 years old today and I feel like she was JUST born. I miss her like crazy, but I know she has A LOT of amazing people to celebrate with and give her lots of love. I love you, Emma, and I can't believe how wonderful and amazing you are! :) Can't wait to see you continue to grow up! And a late birthday shoutout to my sister Emily. She turned 19 on the 16th of December! I can't believe my baby sister is 19! :) almost a non-teenager! I am so proud of you, Emily. You are an amazing woman, and I'm so proud I know you and got to grow up with you. I love you! The Swedish word of the day is "fem år gammal" which is "five years old" and is pronounced "fem or gammal". And "nineteen" is "nitton". Christmas is coming the goose, the turkey, the ham, the duck, the rabbit is getting fat. The next day is "Juldagen" which is our Christmas day, which is the best day. Well here, it's the nothing day. They sit around, mess about with their gifts, watch TV, rest, do whatever. So I will make some Christmas potato soup, which is what I always remember my dad making for Christmas. The next day is "Annandag jul" the day after Christmas. And this day, they celebrate again! What?! Great! We are going to have a smaller get together, with just his sisters and their fiances, and eat a nice big turkey! I am so excited I can't wait to see and feel what Christmas is like here in Sweden. I want to share something so special with Fredrik. I think sharing Christmas the way your spouse did their childhood is really important. The 26th is also special, because it is the day Fredrik first stepped foot in Kansas! One of the best days of my life! All in all, I am in a VERY joyful and jolly mood. There is about 5-6 inches of snow, I baked a beautiful red velvet cake for tomorrow, Fredrik will be home from work soon and will have 4 days off, and tomorrow is Julafton! :) I have been taking pictures of snow, the cake and other interesting things, but I forgot to get my camera cable, so it will have to wait untill later to see pictures! I wish you all a very Merry Christmas! The Swedish word of the day is "julklappor" which means "Christmas gifts" and is pronounced "yulklappor". Here in Sweden, you don't even have to ask them to wrap your Christmas gift, they just automatically do it, even if it isn't even a Christmas gift! :) They are REALLY good and really fast! Here in Lerum, it has been snowing every single night and quite a bit during the day. It doesn't really stay long, but there is a light layer of snow on the trees and ground. It's actually really nice and looks beautiful. In Göteborg, since it is so close to the sea, the snow doesn't get a chance there. Sometimes enough comes to actually accumulate, but not as much as it does in Lerum. But they are saying there is a really big chance of a white Christmas this year! That would be amazing! This is what I woke up to Monday morning! The stairs leading up to my house. The Swedish word of the day is "snö" which is obviously "snow" and is pronounced "snuh". I think this is a funny word to say! To start was an appetizer of mango, avacado, crawfish with sweet chili thai sauce mixed with olive oil, lemon and corriander. Then he cooked kantarell sauce (kantarell is the Swedish mushroom that we pick in the forest and are like 400kr for one kilo. That's about 60 bucks for 2 pounds. Thank god we picked a TON this summer and fall and froze them! :) The sauce is basically kantarell, with this brown stuff that makes it thick and some whipping cream. He also made chicken and fresh noodles! And garlic bread, as you can see! I hope he does this again. It was such a treat to not cook, sit and relax, and not clean up afterwards! I was so full, too! He did a great job! The Swedish word of the day is "middag" which means "dinner". It really feels like Christmas is on its way. Especially here in Sweden. Today was St. Lucia Day. This is a day when young girls dress up at St. Lucy, with a crown of candles on her head, a white "angel" dress with a red shash. She comes in the morning of December 13th, to give sweets such as pepparkakor (gingerbread) and lussebullar (sweet buns made from saffron). Originally, it was the oldest daughter who brought light and sweets to the family. But now, a Lucia is elected for each town. The candle portrays the fire that didn't not take Lucy's life, when she was to be burned. But also, in Scandanavia, is bringing light into the darkest time of the year. Now, in Sweden, to involve everybody, there are Star boys, who wear the same white robe, a pointy hat with stars on it, and a long stick with a shining star on the top. There are also Pepparkakor gubber (ginger bread men), and Santa Claus boys and girls who carry lanterns. They also participate in singing, and usually have a song or two about them. These "characters" walk into the church in a line known as a Luciatåg (Lucia train). They sing the traditional Santa Lucia song and file up into some kind of bleacher structure at the front of the church. Usually, the girl depicting Lucia stands at the front smiling with her hands in a prayer position. She doesn't really have to do much. The other people sing many Lucia songs, including flutes, violins and other instruments. After it's over, they sing the same song they sang when they came in, and file out of the church. It's really a beautiful tradition, and especially cute when children are doing it. I went to Fredrik's mom's school where I watched 3, 4, and 5 year olds do it. Wow, that was adorable! Then on Friday we went to see Caitlins. We also woke up at 7am to watch the Lucia on TV. It was really beautiful and had a lot of good songs! I felt bad for the Lucia though. She has to stand up in front of everybody for a really long time just smiling and holding her hands together. Must be kind of hard! We did a lot of nice stuff this weekend, but that will come later. The Swedish word of the day is "julgran" which means "Christmas tree" and is pronounced "Yul gron"
This is a bit long, but it's quite funny and very very true. I love Swedes, but this is really one thing I step back from and sort of...laugh at. The Swedish word of the day is "kö" which means "line" or "queue" and is pronounced "kuh". Starting Saturday morning Fredrik and I got busy! :) We sent 23 Christmas cards and a package! Wow, expensive. Post service in Sweden is ridiculously expensive! But, it's the holidays, and it made me happy either way! Then we headed to Marias for a "card making party"! That was also fun. We were joined by his mom, his aunt Nina, cousin Therese, his sister Hanna and her boyfriend Andreas. We made 10 cards to send to our family and friends here in Sweden! I was really feeling creative that day! I tried Glögg the first time, and oh man this stuff is good! It's mulled wine, but almost tasted just like apple cider! I love it! We then headed to the movie theater to see "Jul Saga" which is Disneys Christmas Carol, and it was in 3D! It was so good to see it! A little creepy for a Christmas movie, but none the less, we really liked it! We then headed home for a restful sleep because the next day we woke up at 6am to go to Ullared! 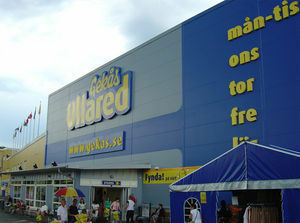 Ullared is Sweden's version of Wal Mart, but there is only one! People come from EVERYWHERE to come to this place! It's really cheap and has pretty good stuff. We headed there at 6:45am, Fredrik, myself, Maria, Hanna and Andreas and it took us about an hour and a half to drive there. It opens at 8am and we arrived at like...8:01. We were feeling good because the parking lot was not that full, so we were in high spirits, with our 500kr Ann gave us in pocket. But then we saw the line. It was like a movie. We were walking and thinking this isn't so bad, and then we turned the corner and the line to walk in was very very long. And we, stupidly, opted not to wear our coats in! But it moved quickly and finally we were in. Wow, this place was impressive! People were everywhere, shoveling items into their carts! Fredrik and I had an idea of what we needed. So we set out and we were done in less than 2 hours! We probably could have done it in less time, but were wasting time untill 10 so we could visit the stores outside of Gekås. His sisters are another story, they stayed in the store untill 1:30! Again, none the less, I had a good time! It was fun to experience that! 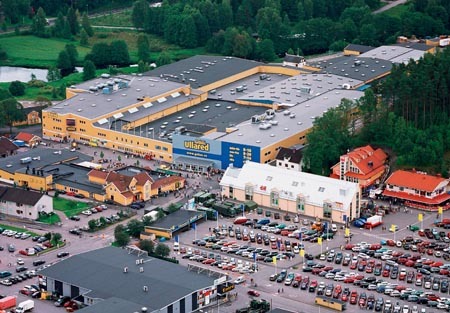 And by the way, there is even a reality show herei n Sweden about this place! You can camp there, so you can get there early. Some families who come from very far away camp for a week and shop all week long! It's crazy! Then, last night, since it gets so dark so early, I was feeling very tired and finally asked Fredrik, what do you want to do? Go home, go somewhere, eat something, watch a movie, and he actually said "let's go to Liseberg". Liseberg is an amusement park in the nice weather but in the Christmas season it is "Jul på Liseberg" or "Christmas at Liseberg". They turn it into a market, with over 250 million lights and it's just really beautiful. This is outside Liseberg. It is a tower that they string lights on the outside to resemble a tree, obviously. Lots of the trees had lights like this, and the ferris wheel was covered, includin the tower again. There was fake snow on a lot of trees, and little booths everywhere you could buy Christmas "things" like decorations and food. It was really a nice place to visit. Soon we will go to a "Slott" which is an old mansion and they set up a Christmas market in there as well! As a Catholic, I have celebrated Advent with the Advent Wreath. Here in Sweden, Christmas decorations are a bit different, as you noticed with the Ljusstake. 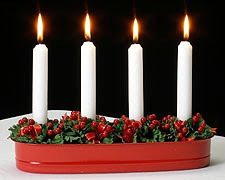 Christmas is definitely a time for lights and another addition to that is the Swedish Advent. It's the same concept as lighting a candle every Sunday until Christmas, but there's is not a wreath and everybody participates.